Volcano Behind, Sun Above and Fish Below. What Could be Better? 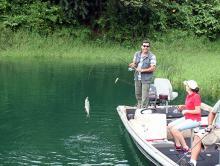 Enjoy fishing Lake Arenal! This fantastic freshwater fishing in one of the most scenic and surreal settings you may ever be in. This lake is the largest in Costa Rica and is only dwarfed by the imposing Arenal Volcano that stands over it. Lake Arenal is Costa Rica’s largest – a total area of 33 sq. miles (85.5 square km) – and best known lake. It’s surrounded by incredible scenery – to the east you’ll see the towering Arenal Volcano. Also, rolling hills embrace the entire body of water. There are a lot of activities you can do at this fascinating spot. 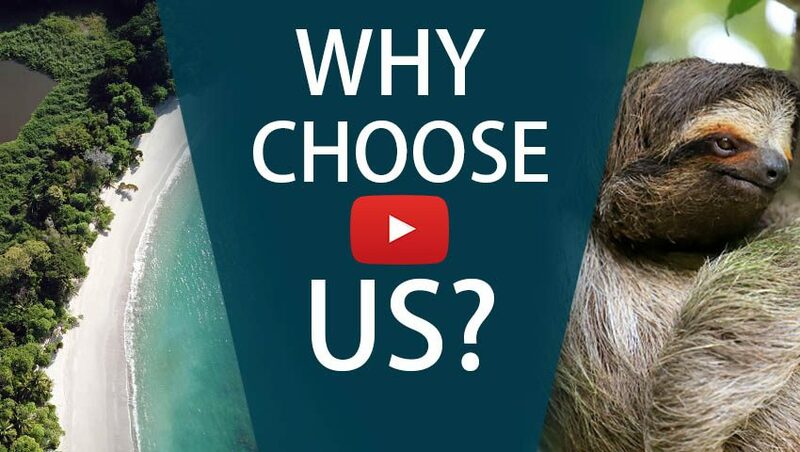 Boat tours, kayaking, sailboarding and windsurfing are among them. Fishing is superb here. You will fish on a custom 20-foot bass boat for machaca, mojarra, tilapia, and the tough rainbow bass. Rainbow bass, a member of the cichlid family, are especially prolific in the lake’s waters. Their tasty white meat and feisty nature make them a challenge – and a delight – to catch. You’ll also have the opportunity of exploring Arenal from above. Enjoy the sights in a Hanging Bridges tour. Discover the hidden secrets of Arenal volcano area as you walk a two-mile circuit. A naturalist guide will go with you and point out animal and plant species along the way. Get to know a different side of La Fortuna in a white water rafting tour. Explore the Class III – IV rapids of Rio Toro as you get to know Costa Rica. 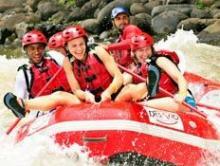 And here’s a little secret: whitewater rafting is one of the coolest ways to travel Costa Rica. Finally, if you’re exhausted, spend an entire day in the thermal waters. This is the life you deserve! Arrive into San José, Costa Rica, where our “Meet and Greet” service will take you to your private transfer. We’ll take you three hours north to see Costa Rica’s biggest and most popular volcano, Arenal. Here you’ll stay at the amazing Arenal Nayara where you’ll have stunning volcano views from your room. Here you’ll stay at the amazing Arenal Nayara. From this top rated hotel you can enjoy breathtaking volcano views right from the your room. Get ready for the first part of your combo tour – the popular Hanging Bridges. These bridges, suspended along the canopy of the rainforest, cover more than 3,100 meters. This will give you a up close and personal view of the incredible flora and fauna in Costa Rica. 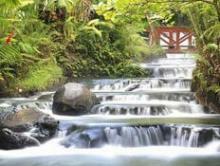 You’ll end your day with a buffet dinner and a few hours to soak in the world famous Tabacon Hot Springs. Heated by magma in the Earth’s core, these natural springs range from 77-103 F.
Day 3: Ready for Fishing Lake Arenal? Head out early with your angler guide for a day on the water of Costa Rica’s largest lake. With years of experience fishing here, you’re in good hands. There are fish waiting for you to catch them! Fish near the various river mouths that empty into the lake. Look for the aggressive machaca, nicknamed ‘mini tarpon’ for their fighting ability. You can also troll the deeper waters (40 feet or more) for giant rainbow bass. Hit the water, but this time in a different way – white water rafting! Experience the natural beauty and excitement of the class III-IV rapids Rio Toro. Combine the thrill of rapids as you see monkeys and toucans. One last day of fishing! If you haven’t landed a rainbow bass for dinner yet, today is your last shot. We will pick you up and take you back to the San José Airport for your international flight home. 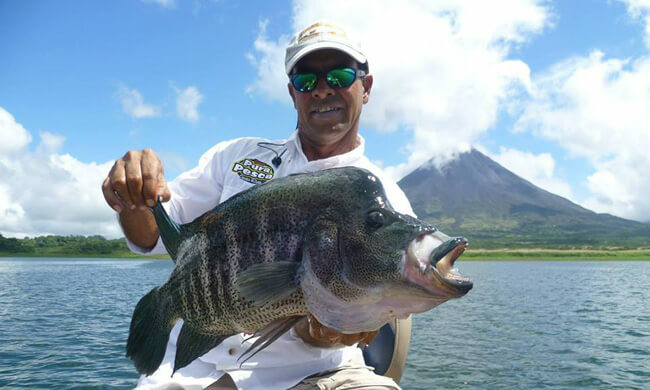 Enjoy a day of spectacular freshwater fishing on Costa Rica's largest lake, Lake Arenal, targeting tilapia, mojarra, the hard fighting machaca, and the delicious rainbow bass.